Bush timber, wire, bark, mud, clay, concrete, stone, etc. Bush carpentry is an expression used in Australia and New Zealand that refers to improvised methods of building or repair, using available materials and an ad hoc design, usually in a pioneering or rural context. "... perhaps because it has been the symbol of hardship and country toil; perhaps because it was thought too crude and rude to be treated seriously as architecture by the academics ... there have been few books and articles written on the subject ... The vernacular, often, is a fragile architectural form, evolved for expedience and resulting—especially in the case of the more primitive examples—in early decay and disappearance ... designed by an amateur, a builder with little training in design and who will be guided by a strict set of conventions developed within his own locality, perhaps paying some attention to fashion, but local only and certainly not international. Within the vernacular building, function is the dominant factor. "... vigorous attitudes to innovation prevailed in the Colonies in the nineteenth century and established for Australia some significant technological leads. Lessons from these attitudes both underline the continuing importance of the 'lone inventor' and hold relevance for education, management, and technology policies today." In Australian parlance, 'the bush' includes not only all remote and rural areas, but ways of living there, especially the limitations and hardships endured.[n. 2] Even though remote areas in contemporary Australia are easily reachable by air and modern communications, there remains a mythology of the tyranny of distance: tyranny over comfort, sophistication, over civilization itself. The expression bush carpentry includes two criteria of 'remoteness'. The first, that the builder is separated (by lack of formal training) from regular methods of construction. The second, separation (by physical distance) from regular resources such as milled timber, fasteners, specialized tools, and similar manufactured products. Those in both 'remote' circumstances are forced to invent and improvise. They produce a necessary structure or object via unorthodox procedures, and it will be serviceable, if inelegant in appearance. These two criteria allow the use of manufactured materials—e.g. milled timber—in an irregular manner, and materials other than wood (stone and iron, for example). They exclude the fabrication of large structures like wharves and bridges, built by contracting tradesmen, which incorporate massive tree trunks, even when a manufactured item, e.g. a steel beam, is available (see illustration of Maldon Bridge repaired by government construction team). 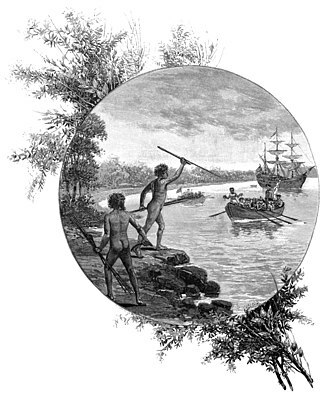 The Australian Aborigines were probably the first 'bush carpenters'. From the Aborigines, European settlers learned how to strip bark in large sheets from particular tree species, and use this for roofs and walls. The skills required are minimal, but they must be well-mastered and neatly executed. Bush carpenters may learn from observing the methods, or the evidence of, another person's work, or entirely through their own invention. The scarcity of any reference books with any local applicability is another factor. "The bush is one of the best educations a young fellow can get if he's interested. That bloke knows livestock, knows how to work them, can cut a straight line with a saw, handle concrete, build a set of yards, fix a motor car—you name it. When you're a hundred miles from town, you can't afford to get a tradesman out for every little job that bobs up. So you've got to slip in and do it yourself ... One of the bosses from a cattle station told me "Sam, if a bloke comes in here in a big hat and ringer boots, he's got a job. They can turn their hands to anything. They know how to work and they don't gutsache all the time." 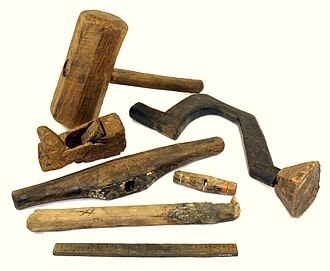 The bush carpenter historically possessed few tools, and rarely any specialized tools. Mann's Emigrant's Guide of 1849 suggests that those heading for Australia's unsettled areas take with them a plentiful supply of a wide variety of tools and fasteners, but he lists as the very minimum, 'A hand saw; Axe; Adze; Mortising chisel; Two augers, 1 and 11/4 inch; Two maul rings; Set of wedges; 1 Spade; Pick-axe; Two-foot rule; Chalk line; Square; A Plumb Bob.' A majority of early settlers had formerly been manual labourers, or servicemen, and brought with them a sound practical ability and aptitude for 'making do'; others observed or helped and copied their techniques. Ron Edwards' 1987 list of suggested tools to construct 'stockcamp architecture' include only an axe, pliers, a hammer and 'perhaps an auger'. Edwards also demonstrates the technique of the Cobb & Co. hitch for tightening fencing wire that fastens structural elements(See Fig. 2 below). With the upsurge in Australia of the restoration of so-called 'Heritage items', the techniques of Australian bush carpentry may be moving closer to formal identification and categorization. Tocal College's 2002 list of tools for its 'Traditional bush timber construction' course includes the broadaxe, adze, sledge hammer and wedges, morticing axe, froe and mallet, draw knife, and hand auger. Structures or objects such as furniture created using bush carpentry techniques often have minimal or even an ad hoc design. 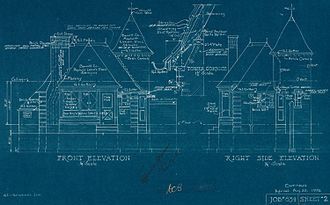 Projects built according to properly drawn plans, for example, architectural blueprints, cannot be called examples of bush carpentry. The design of a barn or shed is likely to be intuitive and functional; the settler's slab hut derived from the vernacular English crofter's hut, a simple rectangular walled shelter with one door, and perhaps holes to allow air to enter. Historically, the materials at hand for Australian settlers usually included a plentiful supply of hardwood,[n. 4] in the form of fully-grown trees and saplings, bark, brush or grass, clay, mud and stone. The classic Australian bush carpentry image is the forked tree trunk used as an upright. Less usual building materials include flattened steel kerosene containers used as wall cladding, or such containers filled with sand and used as building blocks. Sheets of hessian have also been used as walls, for coolness. The etymology of the word carpenter shows that it derives from 'a carriage maker', and later, 'one who builds frameworks'; thus, the term 'bush carpentry' does not necessarily imply that wood is the only material involved. Fig. 1: The frame is constructed from the trunks of trees and saplings, probably obtained in the nearby Maldon Gorge. Fig. 2: Fencing wire is frequently used as a fastener. The Cobb & Co. hitch is much in evidence. Fig. 3: The peaked roof has conventional ridge-pole framing, using milled timber. Fig. 4: The only joinery in use is the half-lap; there are a few housing joints. Fig. 5: The top-plate in the eastern wall is a length of steel pipe. Some steel pipes are used as uprights. Fig. 6: Rough-cast plinths of concrete have been used as footing for the uprights. Some have been cast directly on the ground. Fig. 7: One such footing consists of a 44-gallon drum filled with concrete. Fig. 8: Instead of trusses or joists to brace the walls and support the roof, strands of fencing wire are stretched between the top-plates and tensioned with turnbuckles. Fig. 9: The northern gable-end was fashioned by nailing sheets of galvanized iron onto a sub-frame. Insecurely fastened to the main structure, it has fallen out. Fig. 10: Steel bolts secure the main structural members. One was too long, and a spacing block has been used as a washer. Fig. 11: These split slabs may derive from an older, drop-slab structure. Nail holes are present, and the ends have been chamfered. Fig. 12: A concrete footing is used instead of, or has replaced, a bottom-plate. "Because they are uncomplicated buildings, built by unlettered people in the most direct way, using the materials readily to hand, they often have a character and honesty that are rare and sometimes missing from their more erudite architectural betters. Because they are made of a material with which everyone has a deep-rooted harmony, because they are put together in ways that are easily understood and because their forms are readily comprehended, they are universal buildings whose roughness and even whose frequent dilapidation give them a powerful emotional appeal and impact. They are buildings to be felt rather than reasoned ... Cement works, mines, the railways and factories spawned a large variety of store houses and storage bins, towers and poppet heads, workshops and condensers. Framed up in peeled tree trunks or massive balks of hardwood bolted together, their skeletons of columns, beams and braces had the same forthrightness and frankness of the rural buildings ... sited out in the country where they would seldom be seen, or in ugly industrial areas, or along the waterfront where buildings were not expected to be beautiful they, like the rural buildings, were built with an eye solely to meeting their utilitarian purpose in the most direct and purposeful way. Because of this, they frequently succeeded in being outstandingly beautiful. Through the industrial buildings, the functional tradition of the countryside unknowingly and unconsciously was passed into the twentieth century. The cartoons of Eric Jolliffe, especially those based on his character Saltbush Bill include many examples of bush carpentry; the farm where much of Saltbush Bill is set has houses, furniture and other rural structures—barns, stockyards, gallows—all built using bush carpentry means and materials. Joliffe set himself the task of preserving much of Australia's rural heritage by producing sketches and paintings of such structures. There is often a sardonic or comical note in Australian fiction when bush carpentry is mentioned or described; possibly because there is no comedy or satire residing in competency. "The boat we were on was built and repaired above deck after the different ideas of many bush carpenters, of whom the last seemed by his work to have regarded the original plan with a contempt only equalled by his disgust at the work of the last carpenter but one. The wheel was boxed in, mostly with round sapling-sticks fastened to the frame with bunches of nails and spikes of all shapes and sizes, most of them bent. The general result was decidedly picturesque in its irregularity, but dangerous to the mental welfare of any passenger who was foolish enough to try to comprehend the design; for it seemed as though every carpenter had taken the opportunity to work in a little abstract idea of his own. In Steele Rudd's, Back at Our Selection, (1906) the sequence of stories beginning with "Dave's New House" and ending with "Dad Forgets the Past" have a socio-historical sub-text emphasizing the progress of rural Australia from pioneering to prosperity. In the first story, Dad Rudd, though now a wealthy farmer, builds Dave and his new wife Lily a house, using materials salvaged from a neighbour's derelict slab hut. Dad still thinks like a pioneer: he constructs the house himself, using only the materials available, and spending little or no money. However, Lily's mother is outraged that her daughter is expected to live in 'a pile of dirty old slabs and shingles ... a hole!' Dad Rudd is shamed into hiring proper building contractors and erecting a fine cottage, at a cost of 'three hundred pounds'; indeed, in freeing himself from the penuriousness he knew as a penniless settler, Dad over-furnishes Dave's house such that even Mother 'shook her head disapprovingly'. 'When they climbed the roof Pietro discovered that half the sheets were loose. Henry gave him the nails and directed him to nail down the flapping sheet. But Pietro was hunting round for causes. He discovered that the rafters were rotting and demonstrated it by giving one a hard hit with the hammer. It split from end to end and a couple of sheets immediately blew off the roof. They spent the afternoon cutting trees in the scrub and trimming them for rafters, though nothing had been farther from Henry's intention and inclination. He cut down a few little trees while Pietro cut a lot of big ones. Pietro always took the heavier end when they loaded the rails, but even so, Henry became exhausted. Round about four o'clock he decided to go home. Pietro consulted a diagram he had made. "No sufficient", he said. "Ancora four." ... They finished re-roofing the shed by the week-end. Pietro wanted to know if they would cut some fence-posts next week to repair the fences. Henry thought of how he would suffer if he had to work on the other end of a cross-cut saw with a tireless bear like Pietro. "No", he said, "some other work." For if you tie it with greenhide, it's sure to last the longer. There's no fear of suffocation in the old bark hut. From the 1920s to the 1970s, the average Australian family aimed to own a 'weekender', in addition to their suburban dwelling. (In New Zealand, a weekender is known as a bach). On a block of land close to a beach, near a coastal village, or other place of recreation like a river, lake or mountain, a family might erect a 'shack', or cabin, usually with their own hands, often using materials brought from their city residence, or obtained nearby. Shacks and cabins used as weekenders were sometimes built illegally, in remote or inaccessible areas, for example, within National Parks. Weekenders were not always constructed according to the local council's building code; they were often excellent examples of bush carpentry. 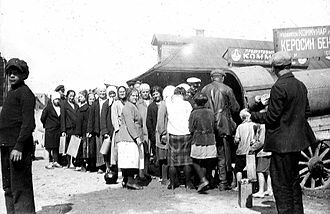 Government organizations usually ignored the presence and the irregular construction of such weekenders, provided the users behaved responsibly. Municipal councils did not charge these shack-builders rates, and did not provide services like water supply, power, sewerage or garbage disposal. By the 1980s, however, as Australia's population increased, many former coastal villages had become towns, or the suburbs of nearby towns. Many Australians had retired to live cheaply in their weekender,[n. 5] placing increasing pressure on local infrastructure and community services. Increasing pressure was then placed on the owners and occupiers of weekenders to destroy or replace their shack with a properly constructed dwelling. The founding of the National Parks and Wildlife Service in 1967 introduced a policy of cabin removal. Owners have subsequently sought to have their cabins declared heritage structures, 'uncommon and endangered examples of vernacular weekender architecture construction' and of 'the limitations imposed by the natural environment and isolated location' i.e. examples of bush carpentry. ^ Bush carpentry may lack a literature due to its perceived inferiority as a practice, e.g. the catalogue of the Australian National Library has no Subject Heading for Bush Carpentry. 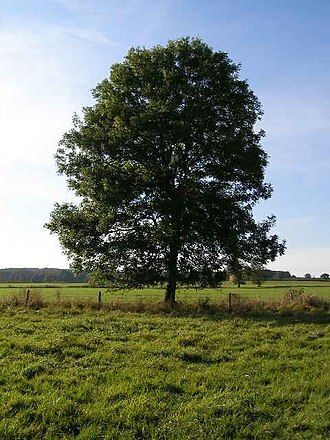 ^ Similar slang expressions in English include 'the boondocks'; 'the tall rhubarbs'; 'the sticks'; all implying remoteness and lack of sophistication. ^ The increasing availability today of prefabricated structures in kit form make both examples less and less likely, but the expression remains in use. ^ The toughness and intractability of Australian hardwoods discouraged attempts at detailed joinery. Fancy, carved bargeboards were never a feature of settlers' dwellings, and whittling never became an Australian pioneer's pastime. ^ Moyal. "Invention and Innovation in Australia ..."
^ Archer, John. The Great Australian Dream. First and fourth chapters. ^ Lewis 5.03.3; Freeland p. 102. ^ Slab hut and floor plan, 1840 N.L.A. ^ Edwards notes that shortage of suitable softwood, which can be worked with simple tools, made the traditional log cabin a less familiar sight on the Australian scene. Edwards, Bushcrafts 3. ^ Bushcrafts 2, p. 38. ^ "Cartoon examples". Archived from the original on 13 January 2010. Retrieved 28 June 2010. ^ Rudd, Back at Our Selection. ^ Schlunke, E. O. 1955. The man in the silo : and other stories. 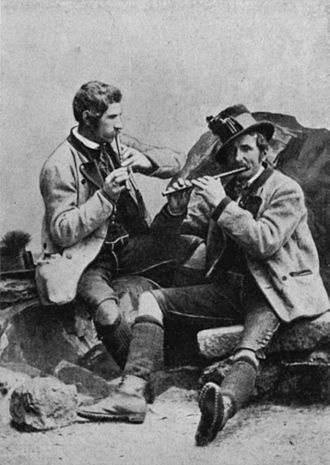 Angus and Robertson. Baker, Sidney J. 1966. The Australian Language: an examination of the English language and English speech as used in Australia, from convict days to the present ... Currawong, Sydney. Fearn-Wannan, W. 1970. Australian Folklore: a Dictionary of Lore, Legends and Popular Allusions Lansdowne, Melbourne. ISBN 0-7018-0088-7. p. 109. Freeland, J. M. 1974. Architecture in Australia. Pelican, 1974. Herman, Morton. 1954. The Early Australian Architects and Their Work. Angus and Robertson, Sydney. Mann, Robert James. 1849. Mann's emigrant's guide to Australia : including the colonies of New South Wales, Port Philip, South Australia, Western Australia, and Moreton Bay London : William Strange. Weller, Sam. 1979. Old Bastards I Have Met. Sampal Investments, Charters Towers. Welsh, Peter. Woodworking Tools 1600–1900 At Project Gutenberg. Wilkinson, G. B. 1849. The working man's handbook to South Australia, with advice to the farmer, and detailed information for the several class of labourers and artisans. London : Murray. 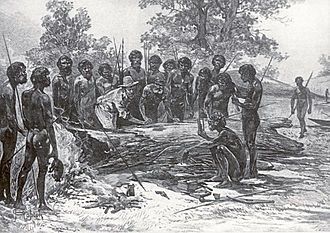 Building and Bushwork for Selectors, Squatters, and Others a series of articles by Frederick Harrison, appearing in The Australian Town and Country Journal during June–August 1881. THE object of the papers prepared for publication under the above heading is to provide, in a concise form, information constantly required by employers and employed especially in the country districts of Australia. The reason for adapting the subjects specially to bush requirements is obvious. Take up any English work, and the materials specified, such as stone, lime, timber, &c, are those indigenous to or easily obtained in that country. But that does not answer for the bush, where the materials available on the spot must be utilized. Bush carpenter at work N.L.A. Australian Inland Mission Collection. Bush carpentry: pig sty N.L.A. Australian Inland Mission Collection. Bush carpentry: bark hut frame N.L.A. Australian Inland Mission Collection. Bush carpentry: meat house N.L.A. Australian Inland Mission Collection. Bush carpentry: slab hut N.L.A. Australian Inland Mission Collection. "Bowen River Hotel (entry 600042)". Queensland Heritage Register. Queensland Heritage Council. Retrieved 13 July 2015. A pickaxe, pick-axe, or pick is a hand tool with a hard head attached perpendicular to the handle. The head is made of metal, and the handle is most commonly wood. The head is an ending in a sharp point, may curve slightly. The stronger the spike, the effectively the tool can pierce the surface. Rocking the embedded spike about and removing it can break up the surface. The counterweight nowadays is always a second spike, often with a flat end for prying. The pointed edge is most often used to break up rocky surfaces or other surfaces such as concrete or hardened dried earth. The large momentum of a pickaxe on a small contact area makes it very effective for this purpose. The chiseled end, if present, is used for purposes including cutting through roots, originally used as agricultural tools as far back as prehistoric cultures, picks have served for tasks ranging from traditional mining to warfare. The design has evolved into other tools such as the plough. During war in times, the pickaxe was used as a weapon. An auger is a drilling device, or drill bit, that usually includes a rotating helical screw blade called a flighting to act as a screw conveyor to remove the drilled out material. The rotation of the causes the material to move out of the hole being drilled. An auger used for digging post holes is called an auger, handheld power earth drill, soil auger. This kind of auger can be a manually turned, handheld device, or powered by a motor or internal-combustion engine. Handheld augers can be used for making holes for garden planting, wood augers have a screw to pull them into the wood, as a gimlet has, and a cutting lip that slices out the bottom of the hole. The auger bit, meant to be used in a brace, in construction, augers are used for special drilling rigs to dig holes for deep foundation piles. 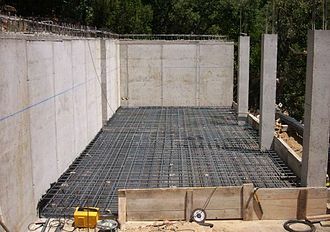 Another use is for forming a piling retaining wall, which can be constructed in the same way as foundation piles. Augers – either gas- or hand-powered – are used by ice fishermen to drill holes to fish through, drilling into maple trees to extract maple syrup is carried out with the use of augers. A fastener is a hardware device that mechanically joins or affixes two or more objects together. In general, fasteners are used to create non-permanent joints, that is, welding is an example of creating permanent joints. There are special-purpose closing devices, e. g. a bread clip, furniture supplied in flat-pack form often uses cam dowels locked by cam locks, known as conformat fasteners. Items like a rope, wire, chain, or plastic wrap may be used to mechanically join objects, but are not generally categorized as fasteners because they have additional common uses. Likewise and springs may join together, but are ordinarily not considered fasteners because their primary purpose is to allow articulation rather than rigid affixment. Other alternative methods of joining materials include, welding, brazing, gluing, the use of force may be used, such as with magnets, vacuum, or even friction. There are three major steel fasteners used in industries, stainless steel, carbon steel, and alloy steel, the major grade used in stainless steel fasteners,200 series,300 series, and 400 series. In 2005, it is estimated that the United States fastener industry runs 350 manufacturing plants, the industry is strongly tied to the production of automobiles, appliances, agricultural machinery, commercial construction, and infrastructure. More than 200 billion fasteners are used per year in the U. S.26 billion of these by the automotive industry, the largest distributor of fasteners in North America is the Fastenal Company. When selecting a fastener for industrial applications, it is important to consider a variety of factors, the threading, the applied load on the fastener, the stiffness of the fastener, and the number of fasteners needed should all be taken into account. Industrial Fastener Materials There are three major steel fasteners used in industries, stainless steel, carbon steel, and alloy steel, the major grade used in stainless steel fasteners,200 series,300 series, and 400 series. Titanium and various alloys are common materials of construction for metal fasteners. In many cases, special coatings or plating may be applied to metal fasteners to improve their performance characteristics by, for example, common coatings/platings include zinc and hot dip galvanizing. 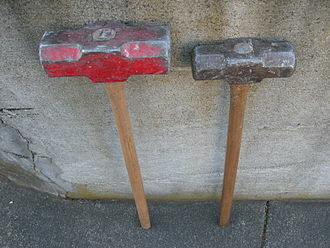 A splitting maul known as a block buster, block splitter, sledge axe, or go-devil is a heavy, long-handled axe used for splitting a piece of wood along its grain. One side of its head is like a sledgehammer, and the side is like an axe. Wedged mauls A typical maul for wood splitting will have a head weighing in region of 4 kg, mauls have a wedge-shaped head, but some modern versions have conical heads or swiveling sub-wedges. The original maul resembles an axe but with a broader head, for splitting wood, this tool is much better than a typical axe. The weight of it is advantageous and due to its width. The wedge section of a maul head must be convex to avoid jamming. Unlike an axe, maul handles are normally straight and closer to round than the elongated oval axe handles tend to be, a mauls handle, unlike an axe, is intentionally used for levering as well as swinging. The handles are made from hickory, though synthetic fibreglass handles have become common. Plastic handles are more difficult to break and their heads are less likely to work free with the levering action of a maul. A drawknife is a traditional woodworking hand tool used to shape wood by removing shavings. It consists of a blade with a handle at each end, the blade is much longer than it is deep. It is pulled or drawn toward the user, the drawknife in the illustration has a blade 23 centimetres although much shorter drawknives are made. The blade is sharpened to a chisel bevel, traditionally, it is a rounded, smooth bevel. The handles can be below the level of the blade or at the same level, the thin blade lends itself to create complex concave or convex curves. Unlike a spokeshave, it not have a closed mouth to control chip formation. They are a piece of equipment in hand-made cricket bats. The operator gently levers the blade to bite into the wood, one works from the centre of the piece to the end, not the entire length all at once. The operator reverses the piece in the horse or vise and works from near centre to trim the fatter end to match the centre. Final work can be done by spokeshave, sanding block or lathe, when operated conventionally, that is blade bevel-side upward the drawknife takes deeper cuts and some novices may find it has a tendency to dive. When operated bevel-side down there is the advantage of removing less stock, the operator applies little leverage from centre and most leverage, so the blade bites deeper, thus removing more wood as they approach the end grain. The operator applies minimal, least force on the handles from centre toward the end grain, the work stock is reversed and same method repeated this time commencing a tiny distance away from centre so as to leave a coarse raised section. The coarse raised section where the two curves meet can be finished with a rasp, spokeshave or other tool. For very rapid and rough removal of stock, the blade is drawn toward the user, the operator immediately stops pulling, and uses the drawknife blade to lever upward so as to flick the splinter or splice out of the worked piece. This technique is advanced and may damage the worked piece and drawknife blade if due care is not observed, the waste shavings, which are particularly durable, are used for basket weaving or for kindling. They make excellent compost and plant bed material, large drawknives can be used to dress logs, and small sizes for carving and shaving. A common use of a drawknife is to create a roughly cylindrical billet of wood for turning on a pole lathe. 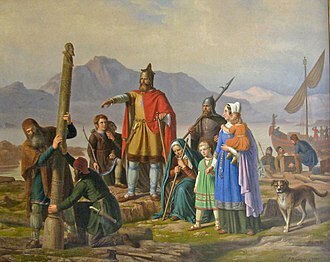 An axe is an implement that has been used for millennia to shape and cut wood, to harvest timber, as a weapon, and as a ceremonial or heraldic symbol. The axe has many forms and specialised uses but generally consists of an axe head with a handle, before the modern axe, the stone-age hand axe was used from 1.5 million years BP without a handle. It was fastened to a wooden handle, the earliest examples of handled axes have heads of stone with some form of wooden handle attached in a method to suit the available materials and use. Axes made of copper, bronze and steel appeared as these technologies developed, axes are usually composed of a head and a handle. 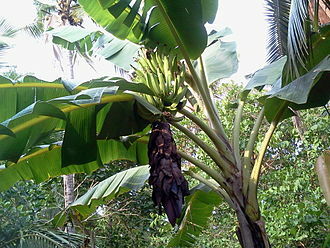 The axe is an example of a machine, as it is a type of wedge. This reduces the effort needed by the wood chopper and it splits the wood into two parts by the pressure concentration at the blade. The handle of the axe acts as a lever allowing the user to increase the force at the cutting edge—not using the length of the handle is known as choking the axe. For fine chopping using an axe this sometimes is a positive effect. Generally, cutting axes have a shallow angle, whereas splitting axes have a deeper angle. Most axes are double bevelled, i. e, less common today, they were once an integral part of a joiner and carpenters tool kit, not just a tool for use in forestry. A tool of similar origin is the billhook, however, in France and Holland the billhook often replaced the axe as a joiners bench tool. Most modern axes have heads and wooden handles, typically hickory in the US and ash in Europe and Asia. Modern axes are specialised by use and form, hafted axes with short handles designed for use with one hand are often called hand axes but the term hand axe refers to axes without handles as well. Hatchets tend to be small hafted axes often with a hammer on the back side, as easy-to-make weapons, axes have frequently been used in combat. Initially axes were tools of stone called hand axes, used without handles, axes made with ground cutting edges are known since the Neolithic period ending 4,000 to 2,000 BC. In Australia a stockman is a person who looks after the livestock on a large property known as a station, which is owned by a grazier or a grazing company. A stockman may be employed at an abattoir, feedlot, on a livestock export ship, or with a stock, stockmen who work with cattle in the Top End are known as ringers and are often only employed for the dry season which lasts from April to October. A station hand is an employee, who is involved in duties on a rural property or station. Some stations are now making changes for the employment of women by building female living quarters and installing hydraulic cattle crushes etc. An associated occupation is that of the drover, like the shearer may be an itinerant worker, a station trainee is known as a jackaroo or jillaroo, and does much the same work as a stockman. A stockman is responsible for the care for livestock and treatment of their injuries and illnesses and this includes, watering, droving, castrating, ear tagging, vaccinating livestock and dealing with their predators. Stockmen need to be able to age by examining the dentition of cattle, sheep. Those caring for sheep will regularly have to deal with flystrike treatments, jetting animals, worm control, pregnant livestock usually receive special care in late pregnancy and stockmen may have to deal with dystocia. A good stockman is aware of livestock behavioural characteristics, and has an awareness of flight zone distances of the livestock being handled. Apart from livestock duties a person will inspect and repair fences and yards that have been broken by storms, fallen trees, livestock. Damper is a type of bread that was baked by stockmen during colonial times. It is made with self-raising flour and water and is cooked in a camp oven over the embers of a fire. In these areas the days in the saddle are often very long as the cattle have to be mustered, after the stock have been yarded they may require drafting prior to branding, shearing or whatever procedures are required or have been planned. The town of Bathurst was founded shortly after, and potential farmers moved westward, the rolling country, ideal for sheep and the large, often unfenced, properties necessitated the role of the shepherd to tend the flocks. A mallet is a kind of hammer, often made of rubber or sometimes wood, that is smaller than a maul or beetle, and usually has a relatively large head. 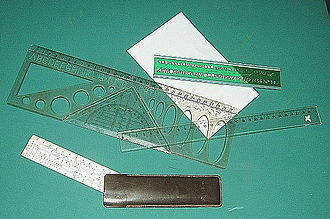 The term is descriptive of the size and proportions of the tool. Tool mallets come in different types, the most common of which are and they are typically used to form sheet metal, since they do not leave marks and are less likely to dent the workpiece. Rubber mallets are used for forcing tight-fitting parts together, for shifting plasterboard into place, in upholstery work. It is a tool of preference for wood workers using chisels with plastic, metal, or wooden handles and it is the most commonly used mallet. Wooden mallets are used in carpentry to knock wooden pieces together. A wooden mallet will not deform the striking end of a metal tool and it is used to reduce the force driving the cutting edge of a chisel, giving better control. Hardwood mallets are used to knock in cricket bats. Copper and leaden mallets are used on machinery to apply force to parts with a reduced risk of damaging them. As these metals are softer than steel, the mallet is deformed by any excessive force, meat mallets tenderise or flatten meat. Made from wood or metal, they are typically two-sided, one flat or with slight bumps, and their use has been reduced with the invention of cube steak machines and other electric tenderisers, but they can still be readily found at cookery stores and in professional use. Plastic mallets, made of nylon, polycarbonate, or polystyrene are used especially in leatherwork, split head mallets have removable faces which can be changed to an appropriate material for the job. Beetle mallets are large mallets with a wood or plastic head, with rounded ends about 15 to 18 inches in diameter. It is used by paviours for tapping paving stones into position when bedding them, beetles are used in jobs such as timber framing to shift the bases of large wooden posts, to fit joints, and to drive in pegs. Dead blow mallets typically have an internal cavity partially filled with shot, lead shot. Bridge-jumping 1998. Note high river levels after heavy rains. A skid-steer loader with an earth auger attachment. Police duel with bushrangers: The Australasian Sketcher 1879 Slab-built farm buildings set the scene.